Repairs to the Attaway Road Bridge over the Gila River will begin on Monday, July 10th. The purpose of the project is to rehabilitate the approach slabs on either end of the bridge, resulting in a safer and smoother ride for vehicular traffic. The project schedule for the next four weeks will include a lane reduction and full closure in various durations. Traffic will be reduced to one lane July 11th – 14th, 17th – 20th, 26th – 28th and the 31st. A full closure of the bridge will be required July 21st – 25th. Delays are expected, motorists are encouraged to plan ahead to allow extra travel time for alternate routes. A detour route using SR-287, SR-79 and Hunt Highway will be established during the full closure period. 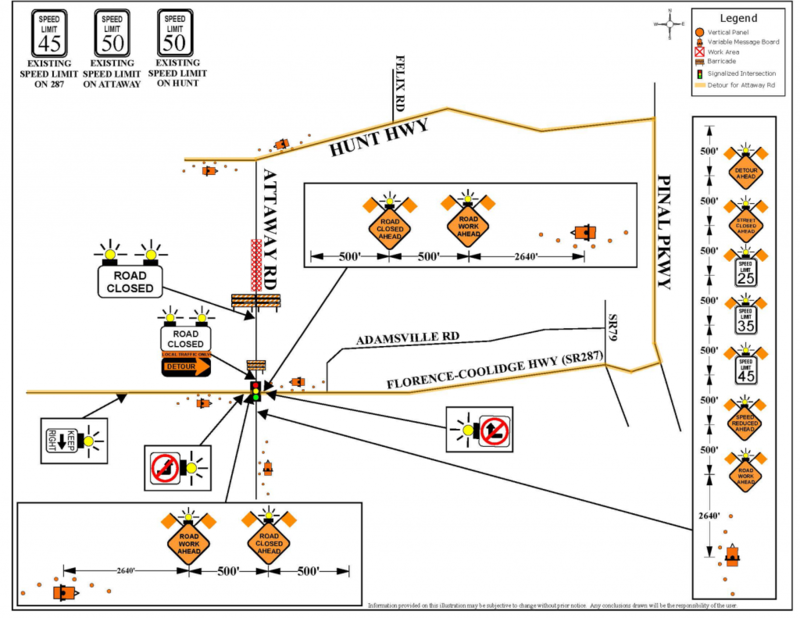 We appreciate your patience as we make these necessary improvements to this major arterial connecting Coolidge, Florence and the San Tan Valley areas.